Sometimes I like nothing better than to straighten things up. Clean out a drawer or two, organize a stack of fabrics, it's probably just a chance to visit with my favorite things. One such opportunity came after a recent trip to Oregon for a sewing retreat with a group of terrific women. Each year, on the way to the retreat we stop at an annual garage sale. The woman who holds it collects the best stuff all year and we are the happy viewers of vintage furniture, kitchen wares and often there are sewing related things. 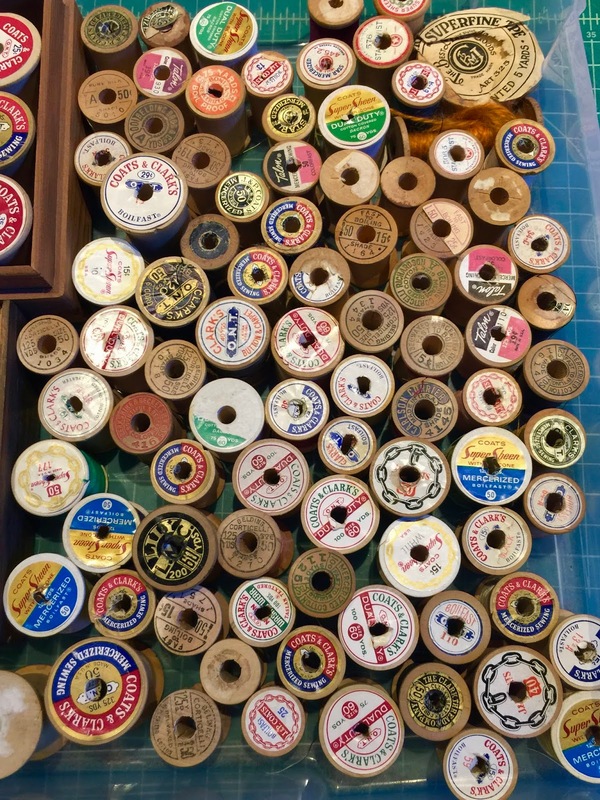 I did find a baggie of old wooden thread spools though. It had two aqua/turquoise colored ones in it, and I save that color in a big glass jar. So I felt justified getting the whole bag for $5. When I went to incorporate the rest of them into ones I already had (left from my grandmother, mother and me) I found my collection beginning to really take shape. Now, I'm wondering what to do with them. Any suggestions? One of my sewing pals, Janet, taught me how to make these clothesline bowls. They are addictive! If you want to make them (many of you have already, I'm sure, they have been super popular) there are plenty of tutorials online. Be sure to get 100% cotton clothesline. I made one for each of the 8 women at the retreat...and then I made some more. Way addictive! Another way to use scrap fabric. I wish it used more of it. The original technique, I think, is to cover all of the clothesline with the fabric, which would use lots more fabric. But I prefer the off white with just a little textile peaking here and there. We are so luck to stay in the beautiful home of Eloise W. Way out in the horse country of Tumalo, between Bend and Sisters. Yes, of course we had to stop in Sisters to visit The Stitching Post. It's mostly quilt cottons but the selection is mesmerizing and of the best quality. Plus they are stocking more garment fabrics so I picked up a wonderful woven cotton for billowy summer pants. We always seem to arrive just when the irises and lilacs are blooming. I took a class with Kayla Kennington last weekend. She is one talented woman. She had lots to teach. I chose her new technique "Everyday Boro". I wanted to use a pattern that was drafted from a RTW garment that I've used before. It has several small pieces that lent themselves to piecing. Of course I used only scraps. And for some reason, after finishing the garment, I still have the same amount of scraps...what the...??? Does that happen to you, too? I really enjoyed Kayla's teaching skills. Just the right amount of attention and not too much instructions leaving more time to just figure it out. Most of the fabrics are knits with the exception of this cotton kantha-like textile that used to be a vest I got in Como, Italy many years ago. It never fit right so I finally cut it up. I love the fabric and have been using it for all kinds of projects. On of Kayla's interesting details is a seam that is closed by using bar tacks. I wanted to try that so here you see it with the little red tacks down the side seams. A close up of the bar tacked side seam. I used a lightweight dupioni silk for the binding. And here is one of Kayla's pieces using another technique she taught us. This one is tacked with a decorative stitch. Her techniques are so eye-catching. Not easy but certainly learnable. I recommend taking a class from her if you can!! Thanks Kayla! I'm off to Tennessee with a handful of sewing pals to attend Shakerag again. Last year was so fun we all signed up again...and a couple more added. We are taking a class from Christine Mauersberger titled "Intuitive Stitch". Hand stitching...here I go again trying to find a way to love hand stitching. Will I ever get it? There will also be lots of southern food involved, the chefs at Shakerag are THE BEST!! So good, in fact, that I am bringing them back to Capitola in July for a Southern Nights stay where they will cook at Gayle's Bakery & Rosticceria! Enjoy your summer and thanks for stopping by, y'all come back now ya hear?